WHMCS 7.1 introduces new and easier ways to track and monitor the automated actions that your WHMCS installation performs for you on a daily basis. 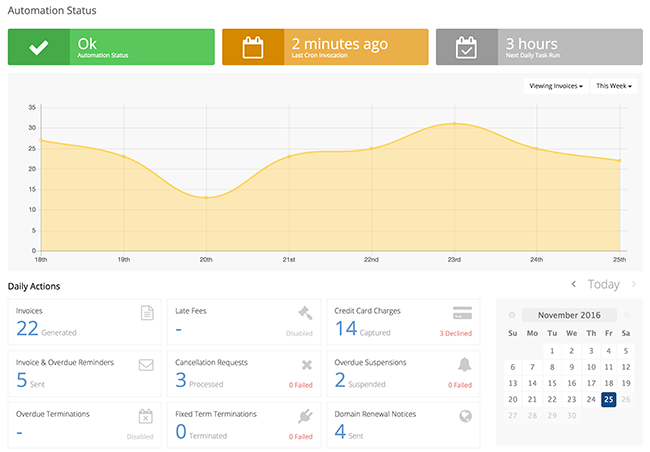 Beginning with the new Automation Overview dashboard widget, key information and stats that would previously only have been available by looking in the daily cron report email are now at your finger tips, with statistics such as number of invoices generated, credit cards captured and accounts suspended. Graphs show the trends and patterns for each automated task over the past 7 days and clicking on any of these will take you to the new Automation Status interface for a larger view and even more detailed information. The Automation Status page is split into 3 key sections. First up is the automation status, letting you know when things are running smoothly and alerting you to any problems. When the cron is configured and executing as expected, it will confirm for you the last time a cron invocation was detected and how long is left until the next daily automation tasks scheduled run time. Next is the recent activity graph. Allowing you to choose the automation metric you wish to visualise and timeframe including the current and previous week, the last 30 days and by month, the graphs allow you to see patterns and trends as they develop, and help visualise the numbers. Lastly, there's the detailed view, showing you the full results from every automated action being performed by your WHMCS installation each day. Defaulting to today, the Automation Status feature allows you to scroll back in time using the calendar to see what happened on previous days, and get a more complete picture of the daily actions occuring within your WHMCS installation. If any failures have occurred, clicking on the failure count allows you to see the items which failed. Failed suspensions and terminations will take you to the new Module Queue, another new feature in WHMCS 7.1, which makes it easier to view and resolve failed API actions. The new Automation Status feature is the latest in a series of cron related improvements in WHMCS 7.0 and 7.1 designed to bring greater insights and flexibility to the automation tasks performed by WHMCS.